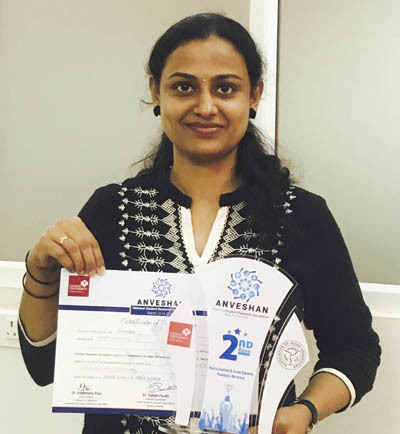 Mangaluru, 25 Mar: Srividya from the Division of Molecular Genetics and Cancer at Nitte University Centre for Science Education & Research (NUCSER) has won the second place in Health Sciences & Allied Subjects category at ANVESHAN 2018-National Student Research Convention held at Ganpat University, Gujarat held from March 12 to March 14. She was the only winner from the South Zone Universities this year. The award included a citation and a cash prize of Rs 50,000. Srividya is working on development of novel and affordable DNA based techniques for detection of gene mutations that interfere with targeted therapy in lung cancer under the guidance of Prof Dr Anirban Chakraborty, deputy director, NUCSER. She had earlier won the third place at the zonal level held at VIGNAN’S (Deemed to be University) Guntur, Andhra Pradesh during February 22 to February 23 and qualified for the National Level Competition. Anveshan - Student Research Convention is an initiative of Association of Indian Universities conducted every year to identify and nurture the young talents and budding researchers in the Indian Universities. In these Conventions, Innovative Research Projects are invited from the Students (Undergraduate to Ph D level), and assessed by a group of experts of the field on well-laid criteria. The Conventions are held at two levels that is Zonal and National. The best Research Projects are conferred with certificates and awards.